Do you want to be an ambassador for the Gothenburg Museum of Art? In that case, join the society called the Friends of the Museum of Art. 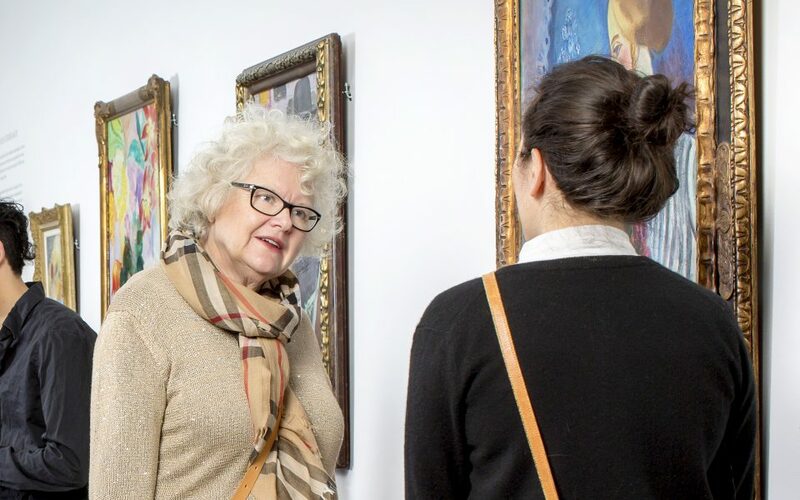 You will take part in making art history, thanks to the new acquisitions to the collection that are made with the support of the Friends of the Museum of Art, and at the same time, you will have the opportunity to meet other art lovers. The society called the Friends of the Museum of Art was founded in 1942. Today, it has around 1 000 members, who are invited to participate in many different activities. As a member, you can attend previews of exhibitions, join art trips to other museums, do art courses and go to gatherings for members. The society also gives you the possibility of joining in a series of lectures in which the staff of the museum provide in-depth presentations about art with different themes and perspectives. The members of the Friends of the Museum of Art always have free admission to the Gothenburg Museum of Art as well as to a number of museums in Scandinavia, and a discount in the museum store. Note that an additional fee sometimes applies to certain temporary exhibitions. For companies: 10 000 SEK annual donation. Private member: annual fee 350 SEK (250 SEK to add an additional family member), 100 SEK for young Friends of the Museum of Art. Permanent members: single payment of 5 000 SEK. For more information contact Eva Lekvall on telephone +46(0)31-16 27 31. Are you interested in children’s book illustrations and want to help to increase knowledge about children’s book illustrations? In that case, you should join the society called the Friends of Children’s Book Illustrations, which has existed since 1989 and currently has 400 members. The society has donated Nordic original illustrations to the museum, and has played a major role in turning the Gothenburg Museum of Art into a leading museum for children’s book illustrations. The collection comprises around 2 000 images by around 70 Swedish and Nordic artists. As a member of the society, you can attend evening lectures and meetings of the society, and take part in popular lotteries with prizes of children’s literature and art. The society publishes a journal for members called Solägget (The Sun Egg) and an information sheet called Solsidan (The Sunny Side) twice a year. Members of the Friends of Children’s Book Illustrations have free admission to the Gothenburg Museum of Art. Note that an additional fee sometimes applies to certain temporary exhibitions. They have a discount at the museum store, as well as a 10% discount at the store of the Gothenburg City Museum. Membership fee: 200 SEK. Students 100 SEK. Institutions and companies 500 SEK. The fee is payable to Postgiro number 44 49 735-2.